"Waiting for Another Fall" is only $5.00CAN plus $3 shipping anywhere in the world! 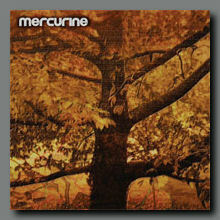 Mercurine "Waiting for Another Fall"
the latest release from Mercurine. nu wave bliss! When I first heard Mercurine a few years ago I became an instant fan of their sound, a blend of new wave and ethereal bliss that immediately caught my attention. There was something shiny and new and beautiful about what they did. I'll admit it, I hearted them. And now, with the release of their second disc "Waiting For Another Fall", Mercurine have lived up to all my previous expectations and surpassed them, delivering a collection of songs that displays confidence, growth, style and substance. The last couple of years writing and playing together have made Mercurine into a slick, tight, well-honed musical unit, and it shows. It really, really shows. Opening track "The Wish" is surely one of my favorite songs by anyone ever. Burbling synths interweave with bass and light percussion while Mera Robert's voice plays throughout, lush, hypnotic and beautiful. The track appeals to me on a really primal level, a song that grabs ahold of my heart and doesn't let go. "Bluemouse" follows, a dark and claustrophobic piece that showcases Byron Brown's brilliant guitarwork, alternating from subtle phrasing to a monstrous roar in the blink of an eye. Mera's voice runs just a touch above a whisper, intoning lyrics that run in circles, playing tricks with your mind. To say that this track is a masterpiece wouldn't be doing it justice. "August in Hell" follows, which, despite its name is a playful song sampling from the online animation "Strindberg and Helium". It's kind of an in joke, locational humour that might not mean anything to you if you're not in the know, but trust me, it's funny as hell. Snort your coffee out of your nostrils type funny. Visit http://www.strindbergandhelium.com/ to be part of the in crowd. "Format HD" features pronounced drums and percolating synths, Mera's voice stretching the lyrics in a sultry manner sure to appeal to fans of more ethereal vocal stylings. Tasteful guitar phrases play throughout, and all of the instruments blend in a practical and economical way that suggest that the band's production skills are just as tight as their songwriting skills. "Nu Groove" follows, a stompy and heavy track, a big song meant for a big room that bleeds into the instrumental track "Copper Rain". There's something anthemic about these two, a pump your fist in the air quality that suggests stadiums and giant inflatable pigs. This is a good thing by the way. Every band should have a pump your fist in the air song. And an inflatable pig. In contrast, "Sunlightgreyskies" has a Cocteau Twins feel to it, with Mera's vocalizing dancing around the track, playing games in the soundfield while sparse guitar alchemy creates a backdrop of new environments and atmospheres. Once you get used to these places and spaces you won't want to leave. And this is where we reach the end. Fans of Mera's work with Oblivia and Black Tape for A Blue Girl will no doubt be thrilled by "Another Ending" where she plays a plaintive cello to accompany Byron's looping guitar. A masterful thing of beauty, this is surely one of the best pieces on the disc, my only regret being that this track wasn't a little longer. Like, ummmmmmm, maybe an hour? Regardless of my wishes for an extended version, "Another Ending" is still a wonderful coda to what is one of my favorite releases of the year so far.